Bookings (church, date and time) for the Sacrament of Marriage can be made by contacting the priest on duty (Tel: 087-2468234). Please note that marriages are not celebrated on a Sunday or Holy Days of obligation. The choice of priest or deacon who officiates at your ceremony is completely yours so long as he is a priest in verifiable good standing. It does not have to be the priest of the church where the wedding takes place. Only those over the age of 18 may celebrate the Sacrament of Marriage in the dioceses of Ireland. All couples getting married in the Diocese of Cloyne are expected to complete a pre-marriage course. 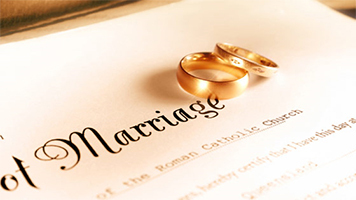 Each Catholic getting married needs to complete a Prenuptial Inquiry Form with one of the priests of the parish in which in which he/she is currently residing. Please contact one of the priests of the parish to arrange an appointment. A Certificate of Baptism* from the parish where you were baptised, which has been issued in the six months prior to the date of the marriage. A Certificate of Confirmation* from the parish where you were confirmed. Evidence of pre-marriage preparation. (A Certificate will be issued to you at the end of the pre-marriage course). * Those who require Baptismal and Confirmation Certificate from Midleton parish, as well as Letters of Freedom to Marry, should contact the parish office. Couples should contact the priest or deacon who will be officiating at their marriage to discuss such matters as the rite of marriage which will be used, appropriate readings, music, etc, before printing the ceremony booklet. In accordance with Part 6 of the Civil Registration Act (2004), any person intending to get married in Ireland must give three months notification in person to the Registrar. This applies to all marriages, whether solemnised by a Registrar or according to religious rites and ceremonies. The Registrar does not have to be the Registrar for the district where you live or where you intend getting married. You will need to make an appointment with the Registrar in order to give the notification. In order to ensure the notification is given at least 3 months before the date you intended getting married on, it is advisable to arrange the appointment well in advance. When you make the appointment with the Registrar you will be informed what information and documents you need to bring with you. When you attend the Registrar you will have to make a declaration of no impediment. The Registrar will issue an acknowledgement to both of you and the proposed solemniser of the marriage confirming the date of receipt of notification. If all the information required has been supplied and there is no impediment to the marriage, the Registrar will issue you with a Marriage Registration Form (MRF). The couple must present this MRF to the priest solemniser in advance of the wedding day.